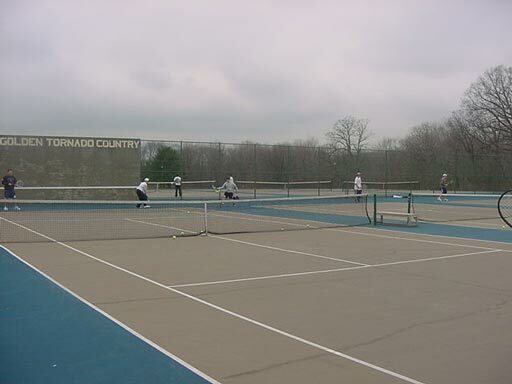 Knoch's doubles team of Kenny Demits and Martin Stasinka earned a win for the Knights. Butler didn’t lose a game during a 5-0 non-section sweep of Montour. Butler swept the singles matches on the way to a 4-1 win over Neshannock. The Golden Tornado won four of their final five to finish the season at 7-5 overall. Devin Fitz (B) def. Nik Bentkowski 6-2, 6-0; Henry May (B) d. Michael DuBois 6-1, 6-1; Cam Sedwick (B) d. Aaron Maggi 6-0, 6-1. Brock Hinton and Tony Santilo won 7-6 in the third set to complete the sweep of the Titans. Doubles: 1-Ethan Turner-Troy Bell (B) def. Adam Bleil-Nick Buckshaw 7-5, 6-2; 2-Tony Santilo-Brock Hinton (B) def. Mike Tremel-Jack Magoun 6-0, 5-7, 7-6. The Golden Tornado (3-0, 2-0) defeated the Titans 27-25, 25-20, 25-22 as Andrew Paterno had 33 assists, Matt Huey and Matt Rudski 15 kills each. A.J. May pulled out the first set of his singles match against Patrick O'Connor of Seneca Valley, 7-6, before taking care of his foe in the second set to help Butler to a 5-0 win over the Raiders in high school tennis. Butler is now 4-4. The Butler boys tennis team picked up its first victory of the season with a 5-0 blanking of Hampton. 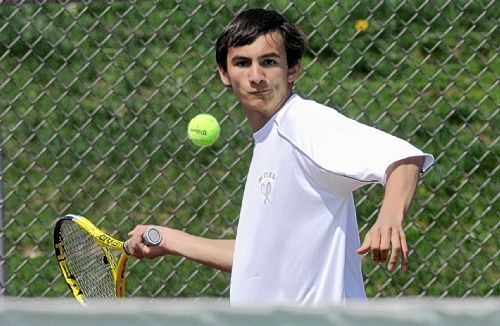 The Butler boys tennis team improved to 2-1 on the season with a 5-0 sweep over Shaler. A.J. 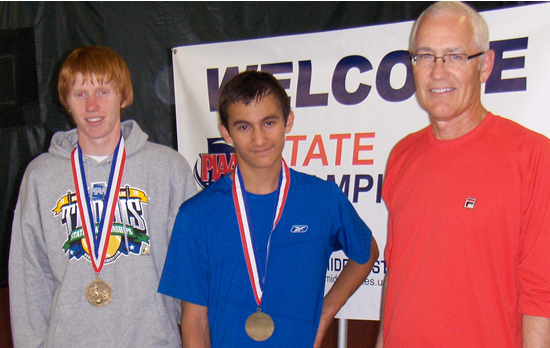 May, Henry May and Ethan Turner all collected victories in singles action. Devin Fitz and Cam Sedwick, along with Gavin Shuler and Martin Zanicky teamed up to earn wins in doubles. 2-Henry May (B) def. Evan Conti 6-2, 6-4; 3-Ethan Turner (B) def. Brent Jackel 6-4, 6-2. 1-Devin Fitz-Cam Sedwick (B) def. Jake Raible-Dan Borgen 6-2, 6-2; 2-Gavin Shuler-Martin Zanicky (B) def. 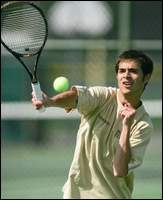 Chris Sienfried-Eric Fisherkeller 6-2, 6-0.
in Butler’s 5-0 boys tennis victory over Ambridge at Lakevue Athletic Club. The Golden Tornado improved to 3-1 with the win. Butler's Will Nesbitt and Zac McCafferty won the No. 1 and 2 singles matches, respectively. 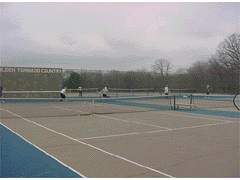 Henry May and Nick Rocchi earned a doubles win for the Golden Tornado. Doubles: 1-Mayank Parashar/Patrick O'Connor (SV) def. David Bright/Josh Daum 7-6(0), 6-0; 2-Henry May/Nick Rocchi (B) def. Matt Hochberg/Alex Park 5-7, 6-4, 6-4.
in helping the squad pick up the nonsection win. 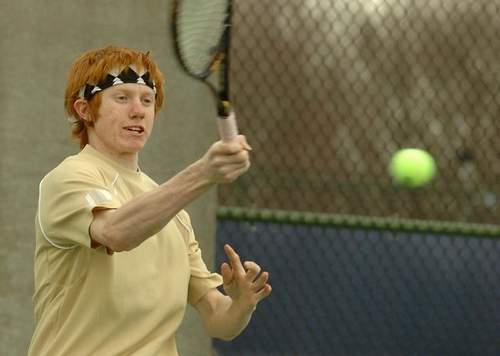 picked up wins in the Butler boys tennis team's 5-0 win over visiting Hempfield. David Bright and Nick Rocchi pulled out a win in the No. 2 doubles match to give the Butler boys tennis team a 3-2 victory over rival Seneca Valley . The Golden Tornado also received wins from Will Nesbitt and Zac McCafferty at No. 1 and 2 singles, respectively. For SV, Andrew Aluise won the No. 3 singles match and the duo of Troy Abbott and Mayank Parashar grabbed a win at No. 1 doubles. WPIAL Section 2-AAA doubles championship. Slamecka and Nesbitt prevailed 6-0, 6-3 to advance to WPIAL Championships. Butler's other doubles team of Stefan Kemp and Zac McCafferty also will advance to the WPIAL finals after defeated Andrew Marczak and Bennett Salvatore of North Allegheny 7-5, 6-4 to win the consolation match for third place. 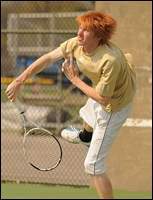 #1 Doubles Kemper May/Zac McCafferty(B) def. Evan Kowalski and Stefan Kemp won at No. 1 doubles as Butler topped North Allegheny, 4-1. Singles: 1-Matt Slamecka (B) def. Andrew Marczak (NA) 6-1, 6-7, 7-6; 2-Will Nesbitt (B) def. Chris Lippiello 6-1, 7-5; 3-Zac McCafferty (B) def. Bennett Salvatora 7-6, 0-6, 6-4. Doubles: 1-Evan Kowalski/Stefan Kemp (B) def. Will Suhrie/Phil Kressenstein 6-1, 6-2; 2-Alex Lapiera/Cesar Parra (NA) def. Kemper May/Zac Cavaliero 6-4, 4-6, 3-6. 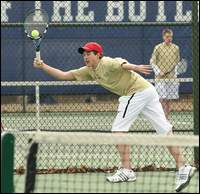 Matt Slamecka, Evan Kowalski and Will Nesbitt swept singles play, losing a combined five games in the process, as Butler slammed North Hills 5-0. #1 Doubles Stefan Kemp/Zac McCafferty(B) def. Butler's 5-0 sweep of Knoch included Zac McCafferty winning at No. 3 singles and the duo of Tyler Bickford/Zac Cavaliero winning the second doubles match. The Tornado are now 10-0. Singles: 1-Matt Slamecka (B) def. Jack Boros 6-0, 6-0; 2-Will Nesbitt (B) def. Sean McDonald 6-0, 6-0; 3-Zac McCafferty (B) def. Nick Pfeiffer 6-0, 6-0. Doubles: 1-Kemper May/Emil Kemp (B) def. Chris Ludwiczak/Bret Nickerson 6-1, 6-0; 2-Tyler Bickford/Zac Cavaliero (B) def. Tim Fritz/Corey Miller 6-2, 6-2. Butler moved its season record to 11-0 by dismantling Shaler 5-0. Matt Slamecka, Evan Kowalski and Will Nesbitt each won their respective singles matches to improve Butler to a perfect 13-0 record. Another day, another dominating performance for the Butler boys tennis team. Butler lost only one set the entire afternoon against Fox Chapel. the semifinals and finals May 22 in Hershey. PIAA Class AAA Team Tournament at Lakevue Racquet Club. Singles victories went to Matt Slamecka, Evan Kowalski and Will Nesbitt. Doubles wins were earned by Stefan Kemp-Zac McCafferty and Kemper May-Emil Kemp. The Golden Tornado will face District 1 champion Council Rock North in a quarterfinal match in Hershey. All three Butler singles players won 6-0, 6-0 decisions as the Tornado rolled to the win. The Knights' lone win was by its No. 1 doubles team of Jack and Joe Boros. helping the Golden Tornado to a 5-0 sweep of Central Catholic. Butler's No. 1 doubles team of Stefan Kemp and Andy Sykes and No. 2s Kemper May and Matt Fend each recorded victories to help send the Tornado to the section win. singles matches as Butler kept rolling with a 5-0 win over Sewickley Academy. Matt Slamecka, Evan Kowalski and Will Nesbitt captured all three singles matches to give the Tornado the win over the Raiders. Matt Slamecka, Evan Kowalski and Stefan Kemp each captured their singles matches to lead the Butler tennis team to a 3-2 victory over visiting North Hills in a mutual season opener. Matt Slamecka, Evan Kowalski and Stefan Kemp swept the singles matches as the Butler tennis team downed host Shaler 4-1..